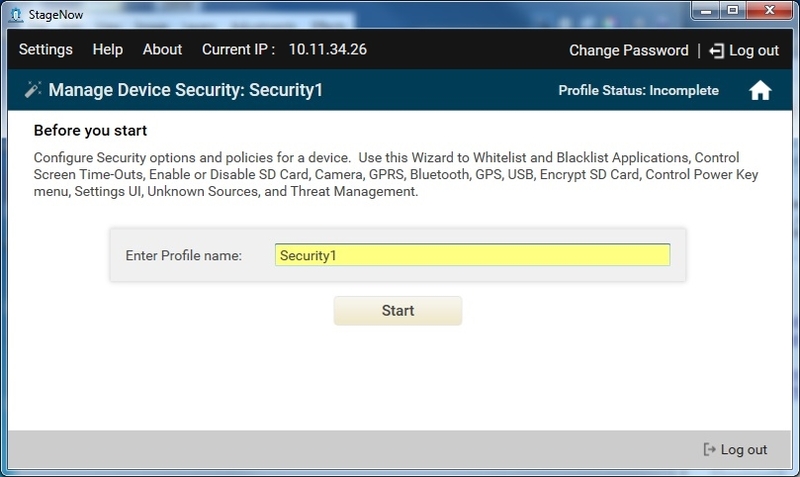 Use this Wizard to configure security options and policies for a device. This can whitelist and blacklist applications, control screen time-outs, and enable or disable an SD card, camera, GPRS, Bluetooth, GPS, or USB. This can also encrypt SD cards and control the PowerKey menu, settings UI, unknown sources, and threat management. Select the Manage Device Security Wizard, and select Create. Select whether or not to perform Application Whitelisting. If you select Yes, see Setting Types / AccessMgr for instructions. Select whether or not to Blacklist an Application. If you select Yes, see Setting Types / AppMgr for instructions. Select whether or not to control the Display Timeout. If you select Yes, see Setting Types / DisplayMgr for instructions. Select whether or not to control the Screen Lock Timeout. If you select Yes, see Setting Types / DevAdmin for instructions. Select whether or not to control the Installation of Applications from Unknown Sources. If you select Yes, see Setting Types / DevAdmin for instructions. 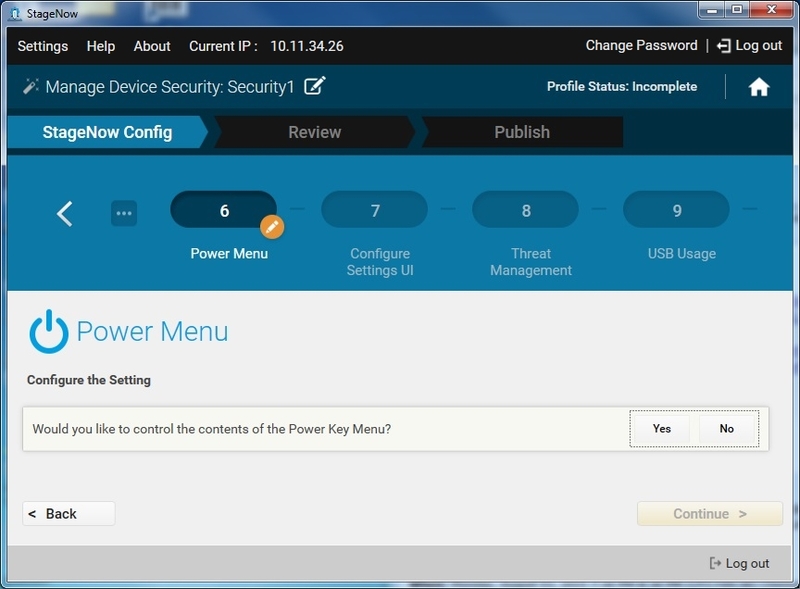 Select whether or not to control the contents of the Power Key Menu. If you select Yes, see Setting Types / PowerKeyMgr for instructions. Select whether or not to control what the Settings UI can accomplish. If you select Yes, see Setting Types / SettingsMgr for instructions. Select whether or not to configure Threat Management. If you select Yes, see Setting Types / ThreatMgr for instructions. Select whether or not to control USB usage. If you select Yes, see Setting Types / UsbMgr for instructions. Select whether or not to control Wireless usage. If you select Yes, see Setting Types / WirelessMgr for instructions. Select whether or not to control Camera usage. If you select Yes, see Setting Types / CameraMgr for instructions. Select whether or not to SD Card usage. If you select Yes, see Setting Types / SdCardMgr for instructions. Select whether or not to encrypt the SD Card. 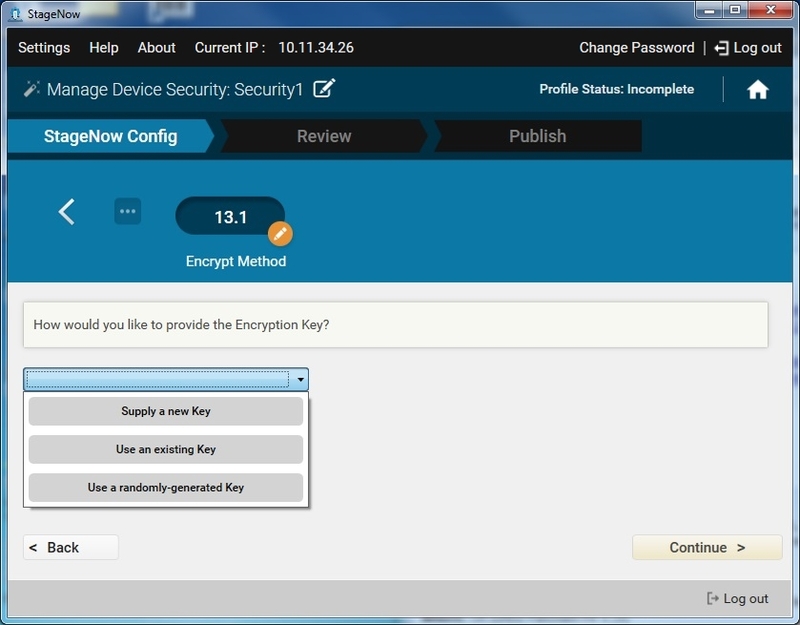 If you select Yes, select the method for providing the Encryption Key. Then see Setting Types / EncryptMgr for instructions.